We get it. Sometimes you’re just not “feeling it.” Life is busy, and there aren’t enough hours in the day to get everything done you need to, let alone exercise. So maybe you’d rather stay sleeping in your warm, comfy bed. Or maybe you’d rather go out with your friends. Or maybe you just don’t feel like your workouts are making much of a difference. Does this sound like you? Want to add some motivation and fire under you? Lets go! Okay, so we know that setting a workout routine doesn’t exactly make you motivated. However, it does give you something your body looks forward to. If you already have on your calendar and in your mind that you are set to wake up early three times a week to go exercise, then there are no excuses for you not to go. Remove those invisible barriers by setting up a plan of action and attending consistently. You are less likely to push yourself to exercise if it’s not a priority. Once your gym routine becomes a habit, it won’t require willpower. KUBEX was designed with your life and your schedule in mind. Our KUBES have been optimized to get you a full, effective workout in just 30 minutes. You don’t have to worry about planning your workout. You never have to wait for a machine. In fact, it’s like having your own personal gym and trainer. All you need to do, is show up. A study conducted by the University of Southern California showed that people were more likely to enjoy a workout when they had a workout buddy, as opposed to those who did not. Having a friend at the gym makes your workouts more fun, gives you accountability, and even helps you step up your competition. They offer support, can help coach you, and even be your own personal cheerleader. Having a workout buddy Increases your chances of success as they push you to finish strong and meet your goals. This one is a no-brainer. If you want to enjoy workout out, you need to find a gym or facility that offers you amenities you like. This will motivate you to keep returning often. KUBEX Fitness has several locations that offer state of the art exercise equipment with easy to follow digital animations–making it a breeze for anyone to follow. KUBEX is also very clean and sanitary, as our rotating cleaners sanitize several times throughout the day, unlike many other gyms. We are committed to keeping your workout experience clean and healthy. In addition, our facilities also provide whole food smoothie bars–helping you fuel your body with nutritious, organic ingredients. Nothing gets you movin’ and groovin’ quite like some upbeat tunes. In fact, several studies over the last decade have shown the positive effects that music has on your cognition. Music helps people relax, have fun, and push themselves to their max. If you’re looking for some new tunes to add to your playlist, check out these top 100 workout songs by clicking here. The mind is a tricky thing. We play into what it tells us, and often, it’s very critical. Spinning those negative thoughts into positive ones enhances our mood, and gives us the desire to improve. Try posting uplifting word affirmations throughout your house so you can be reminded. Be kind to yourself, and be forgiving. Nobody is perfect, and it’s important to be easy on yourself when you make mistakes. 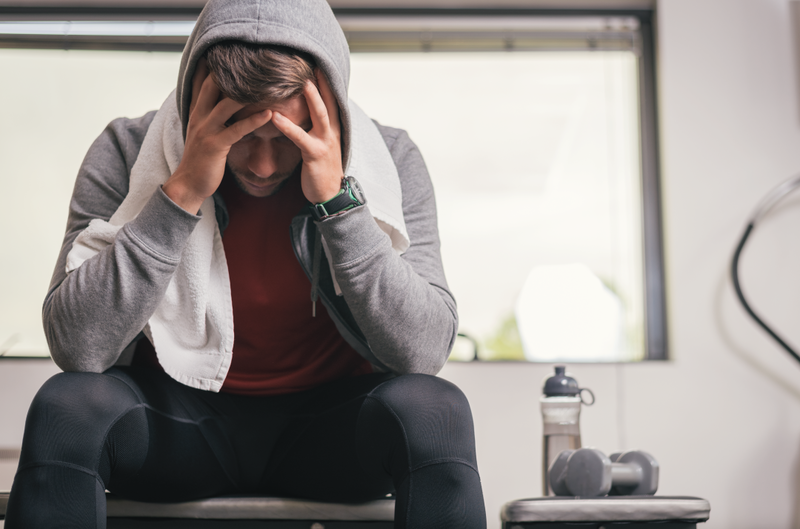 If you’re too hard on yourself, you’ll really struggle to be motivated to exercise again. Nothing is more deflating to your motivation than putting forth the effort for months to exercise, only to feel like you’ve gotten nowhere. Chances are, you ARE making progress, but it may be a little more gradual, and hard to notice. Not everything can be measured on a scale. Don’t be afraid to share your progress with your friends or on social media either. Studies show that publicly sharing your progress can actually motivate you to successfully reach your goal. In addition to your weight, take measurements of your different body parts (calves, hips, thighs, biceps, etc), record the time it takes you to complete a particular exercise, track how many reps and sets you do in a workout, and don’t forget to keep a food journal. After doing this, you’ll be able to look back in awe of how far you’ve really come. With our body scan technology, KUBEX makes it easy to track your fitness goals and results. Let’s be honest here. Who really wants to set a goal they know they will never obtain? Neither do we. Setting unrealistic expectations will have you feeling deflated faster than the footballs on the New England Patriots’ field. KUBEX makes it easy to stay committed and on track with your fitness goals. Just 30 minutes a day, three times a week, is all it takes to experience the amazing changes that will happen to your body and your life! Rewards and incentives reinforce good habits. Invest in yourself, work for yourself, and reward yourself for hitting your target goal. A reward could look like some extra relaxation time, or even a new exercise outfit. For a list of ideas to help you find good rewards, click here. Try to avoid using food incentives as rewards. After all, you’re not an animal. And remember, the biggest reward for a job well done, is to have actually DONE it. While we know that getting motivated isn’t always easy, at KUBEX we try to help make it easier on you by taking care of all of the hard stuff–so that all you have to do is show up and follow the routines. We are a gym for real people with realistic schedules and average knowledge of fitness. Let us help you ignite that fire, and keep it burning. Come in today and see what all the fuss is about!